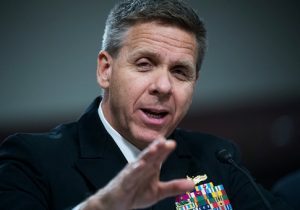 Adm. Philip Davidson, the new Pacom commander, testified that China's military buildup includes significant numbers of advanced missiles, aircraft, ships, submarines and nuclear forces and he called China "the greatest long-term threat to a free and open Indo-Pacific region." "Through fear and economic pressure, Beijing is working to expand its form of communist-socialist ideology in order to bend, break, and replace the existing rules-based international order," Davidson told the Senate Armed Services Committee. "In its place, Beijing seeks to create a new international order led by China and with Chinese characteristics," he added, an outcome that will replace the over 70 years of U.S.-backed peace and stability. Davidson testified that new U.S. weapons and forces will be added to respond to the Chinese buildup of its conventional, nuclear, and "gray zone" warfare capabilities—information and influence operations below the level of traditional armed conflict. The command currently is staffed with around 375,000 military and civilian personnel, about 200 ships, including five aircraft carrier strike groups, and around 1,100 aircraft. "Over the last 20 years, Beijing has undertaken a massive effort to grow and modernize the People’s Liberation Army (PLA)," Davidson testified. "The PLA is the principal threat to U.S. interests, U.S. citizens, and our allies inside the first island chain—a term that refers to the islands that run from northern Japan through Taiwan, the Philippines, and Indonesia—and the PLA is quickly increasing its ability to project power and influence beyond the first island chain." The Chinese military buildup includes both qualitative and quantitative efforts to modernize forces and boost both numbers and lethality of its weapons. Sen. James Inhofe (R., Okla.), the new chairman of the Senate Armed Services Committee, said the military needs "urgent change at a significant scale" to deal with China. "Our military advantage and deterrent edge in the Indo-Pacific is eroding," Inhofe said. "The Chinese Communist Party leadership in Beijing senses weakness. They are testing our resolve, and if we do not act urgently, they may soon conclude that they can achieve their goals through force. We can't take that peace for granted." Davidson said Pacific forces currently are oriented toward responding to threats in Northeast Asia and are being repositioned to better respond to conflicts further south, such as in the South China Sea. The objective is for U.S. forces to "regain the advantage" militarily in the region, he said. New military bases are being sought in that region along with closer cooperation with regional allies, he said. Other areas for strengthened military forces include bolstering special operations forces for both irregular and unconventional warfare, and bolstering anti-submarine warfare capabilities. New long-range mobile land-based missiles are needed to better deter China's large force of intermediate-range missiles, Davidson said. One new flashpoint for the United States and China is the South China Sea, where Beijing has built up some 3,200 acres of islands and is now deploying advanced missiles on some of the new islands. U.S. trade with regional states in Southeast Asia totaled more than $1.8 trillion in 2017 and more than $1.3 trillion by the third quarter of 2018. Davidson testified last year during his confirmation hearing that Chinese militarization in the South China Sea had effectively given the PLA control over the strategic waterway "short of war." Pacific Command forces have countered the attempted takeover by conducting more frequent naval warship passages and military flights to challenge the Chinese claims. The most recent freedom of navigation operation took place Monday when two U.S. warships passed close to the disputed islands called Second Thomas Shoal and Mischief Reef. U.S. military operations to establish freedom of navigation and overflight are critically important for the United States, Davidson said. "This is about the free flow of communications," Davidson said. "That's oil. That's trade. That's economic means. It means the cyber connectivities on the cables that travel under the South China Sea, which are deep and profound coming out of Singapore, and it includes the free passage of citizens between all the great nations of the world." Davidson said the dangers of miscalculation have increased as a result of Chinese militarization. Large numbers of commercial airline flights regularly transit the sea. "And each time that happens, there is somebody with a surface-to-air missile and a Chinese soldier evaluating whether that traffic can go on a day-to-day basis," he said. "I think it's quite hazardous to the global security, and I think it's quite pernicious that China would take such action." Sen. Dan Sullivan (R., Alaska) asked Davidson whether China had violated a pledge made in 2015 by Chinese President Xi Jinping to then-President Barack Obama not to militarize the South China Sea islands. "So President Xi … he obviously didn't keep his word when he made that statement in the Rose Garden next to President Obama, is that correct?" Sullivan asked. "That's correct, sir," Davidson said. "In the most liberal interpretation of militarizing those islands, China in April 2018 populated those islands with anti-ship cruise missiles, with surface-to-air missiles, and electronic jammers," Davidson said, noting some islands with 10,000-foot-long runways were already in place. "But now they have the weapons, they've got sufficient military cadre and they've stepped up their operations both in the maritime and with bomber sorties and fighter sorties in a way that makes it clear that those islands are to support them militarily." Beijing is asserting maritime claims in the South China Sea that are contrary to international law. The expansive claims "pose a substantial long-term threat to the rules-based international order," Davidson said. China ignored a 2016 ruling from an international tribunal, the Permanent Court of Arbitration in the Hague, that ruled China's claims of historic rights over most of the South China Sea are illegal. Davidson declined to discuss during the open session how the U.S. military would respond to a Chinese military incident in the South China Sea. Asked if U.S. military logistics could support a military surge to Asia to counter Chinese aggression, Davidson said military sealift capabilities need to be improved. "One of the other key needs for the region, is … the need to recapitalize our sealift fleet," he said. "It is decades old now [and] needs to be replaced nearly desperately." Further north, Beijing is using its military forces to press similar expansive maritime claims to Japan's Senkaku Islands in the East China Sea, Davidson said. Chinese economic pressure in the Asia can be seen in offering short term loans that produce "unsustainable debt, decreased transparency, restrictions on market economies, and the potential loss of control of natural resources" for states in the region. For example, in December 2017 Sri Lanka gave China control of its newly built Hambantota seaport with a 99-year lease because Sri Lanka could not afford debt payments on Chinese loans. As a result of China's so-called "debt diplomacy," Malaysia cancelled three projects with China worth $22 billion in August 2018 over concerns about Beijing's corrupt practices and denouncing the loans as Chinese "colonialism." China also is seeking to control areas of the arctic and Antarctica. "Beijing recognizes the growing strategic significance of the Arctic and Antarctic and has signaled its plans to assert a greater role in these regions," Davidson said, noting the encroachment is part of a "polar Silk Road" economic plan. Another threat posed by China comes from exports of the opioid fentanyl and precursor chemicals that are fueling the opioid crisis in the United States. China's Xi pledged to regulate fentanyl in a meeting with President Trump in December. "We look forward to seeing tangible progress," Davidson said of the Chinese promise to curb fentanyl. China deployed its first aircraft carrier group and has a second carrier that will join the fleet this year. Supporting the carrier group are new Renhai-class guided-missile cruisers. Fuyu-class fast combat support ships are also backing the carriers. Advanced J-20 stealth fighters entered service in February 2018 and a more advanced fighter is underway. A new heavy-lift transport, the Y-20, is now deployed with significantly larger payload and lift capability. Advanced S-400 surface-to-air missile, with a 250-mile range, will expand the PLA air coverage over the Taiwan Strait and other high priority facilities. New weapons with next-generation technologies and advanced weapons systems are being built including hypersonic glide vehicles, directed energy weapons, electromagnetic railguns, counter-space weapons, and unmanned and artificial intelligence-equipped weapons. Nuclear forces are being expanded with new ballistic missile submarines. A new DF-26 intermediate-range missile is deployed capable of striking Guam, Alaska's Aleutian Islands, and other Pacific targets. A new heavy intercontinental ballistic missile, the DF-41 with multiple warheads is being tested. Regarding Taiwan, Davidson said there are growing concerns about Chinese military intervention based on harsh rhetoric from Xi toward the island. "We continue to be concerned with China's military buildup across the strait, Beijing’s opaqueness about its military capability and capacity, and its unwillingness to preclude the use of force to resolve the cross-strait issue," Davidson said. Army Gen. Robert B. Abrams, commander of U.S. Forces Korea, said the Trump administration's diplomatic outreach to North Korea has cooled tensions on the Korean Peninsula. "Today is day 440 since the last strategic provocation from the DPRK, the last time since we have had a flight—missile flight test or a nuclear weapons test," he said, using the acronym for North Korea. "The reduction in tension on the peninsula—it is palpable."